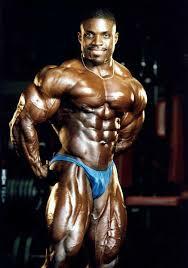 he's one of my all time favorite bodybuilders. except for the abs i don't see the big deal. No he is not natural anymore. Possibly in that pic though. I know for a fact he loves Excstacy and other recreational drugs...Seems the drug usage seemed to grow when he started juicing. I don't know why he keeps posing his side tricep. It looks pretty weak. Stan lives in the San Fernando Valley, which is north of Los Angeles, and 20 miles west of Pasadena. Stan is a personal trainer at Powerhouse Gym of Chatsworth, and enjoys the bodybuilding sport, I think he just placed 2nd at the NPC Nationals in 2004. He comes to our offices every month or two to say hello. I did an interview with Stan on his tatoos, and more here. funny, I thought the secession ballot initiative failed. and I don't think he was ever natural in a competition. I saw him on television recently at a Natural event. He looked alright, but some guy he was standing next to really made him look puny. Is he still having Chris Cormier as his mentor? His chick Amimet (sp) a VFX girls is pretty hot, skinny, but still hot. Is he still with her? He put down the pros for juicing on discovery channel and now he does it. Wrong guy Onlyme, That is Tito Raymond's girl. That is what Tito Raymond is famous for. Althought Tito and Stan do favor one another the tan and hair), Tito has better muscle seperation and is a white dude. Stan is White/Japanese.